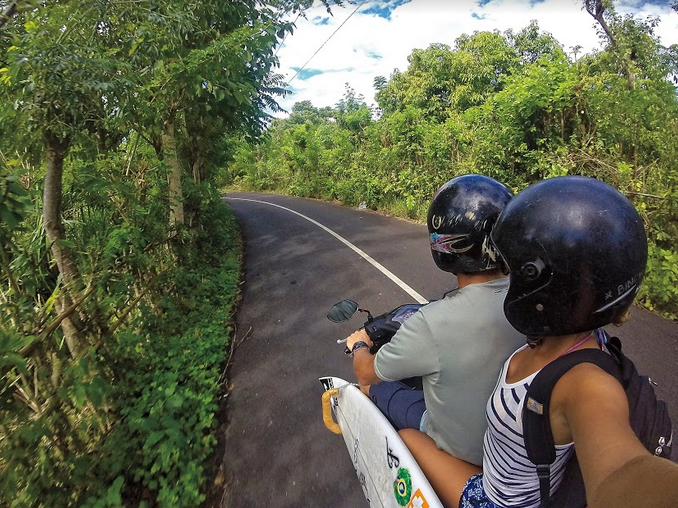 The best way to maneuver Bali is by scooter. Zipping down the tight jungle roads throughout the Bukit Peninsula was memorable, to say the least. We had always dreamed of traveling the world together. So when our college graduations had come and gone (Shaun from Cal Poly San Luis Obispo, which he attended after putting his surfing career on hold, and Hayley from UC Santa Barbara), it was finally time to realize that dream. It was an easy decision to embark on an international journey so that Shaun could compete professionally in the World Surf League’s (WSL) World Qualifying Series (WQS) of surf contests. 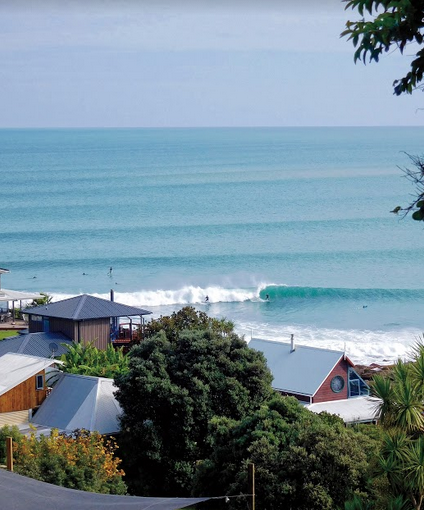 Raglan, New Zealand- land of the endless lefts. This is Whale Bay, just south of the famous Manu Bay. Although there wasn’t any surf contests in New Zealand, there was never a shortage of surfing. The six months following graduation consisted of countless nights of research and planning, culminating in the purchase of one-way tickets from San Francisco to Australia. We landed in Sydney without a return date and nothing but our backpacks, a 40-pound surfboard bag and the desire to experience unfamiliar parts of the world while Shaun pursued his surfing career. 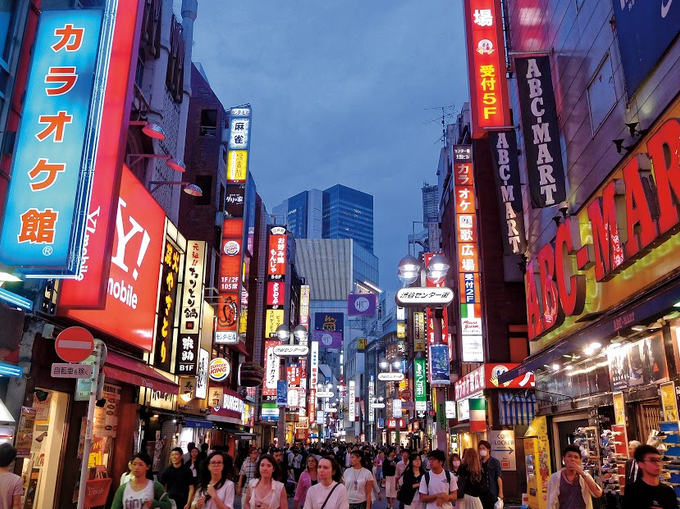 It was exciting to have an open-ended itinerary but nerve wracking to not know what was next. Following the WQS surf contests took us across three continents. We started with two months on the East Coast of Australia, followed by one month living in a surprisingly comfortable camper van in New Zealand, three weeks chasing the swell in Bali, two weeks enjoying Japan’s unique culture, and one month exploring Europe, hopscotching from England to France to Spain. Traveling according to the WQS requires flexibility. A surfer only knows if they’re confirmed in an event one month prior, and contests can be cancelled with little notice. Less than 30 days to book an international flight can be tricky. While we were in Bali, Shaun gradually moved up the waitlist for an event in Chiba, Japan and was finally confirmed just a handful of days before the contest started. Within 24 hours, we changed our Airbnb reservation, cancelled a flight to Singapore and took off to Tokyo—spontaneous travel at its best! Our daily routine with breakfast in bed. 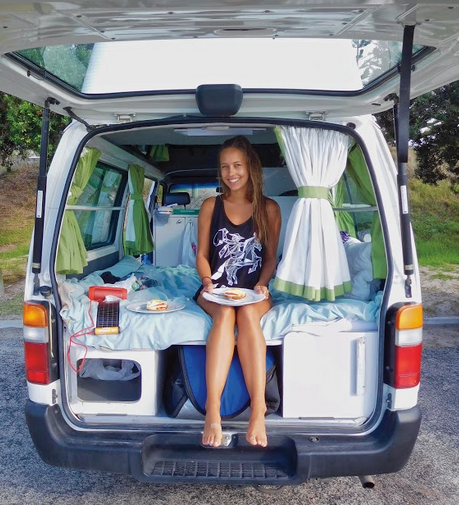 We learned to live on wheels for four weeks as we explored both the North and South Islands of New Zealand. Our cozy home included a mini-fridge, stove-top, sink, cabinets and a full-sized bed. Surfing around the world at places like Snapper Rocks on the Gold Coast of Australia and the Basque Country of Europe is what every surfer dreams of. However, the WQS is notorious for being a tough grind that requires consistency and grit from the surfer in order to qualify for the prestigious World Championship Tour (WCT). Shaun competed in a total of 12 contests in the first half of 2016. Competing against athletes from different countries and cultures around the world forces a competitor to grow as an athlete. After a few tough results, this year became a learning experience for Shaun. The hardest part about losing was getting past it and learning from the mistakes in order to improve and prepare for the next contest. Throughout the ups and the downs of long-term travel, like balancing a budget while buying flights on a whim, we felt that every challenge was worth it. Whether we were living in a camper van or staying at a four-star resort, we appreciated every moment and can’t wait to do it all over again in 2017. Learn more about the couple’s adventures at overtimeoverseas.com. Booking a last-minute fight to Japan was an expensive but excellent decision. Tokyo was by far the most extraordinary and unparalleled city we visited. It’s vibrant, delicious and, despite being the world’s most populated city, incredibly clean. The European leg of the WQS had back-to-back events in France, beginning here in Lacanau-Ocean. Photo: Laurent Masurel, WSL.